Are you keeping your employees satisfied? 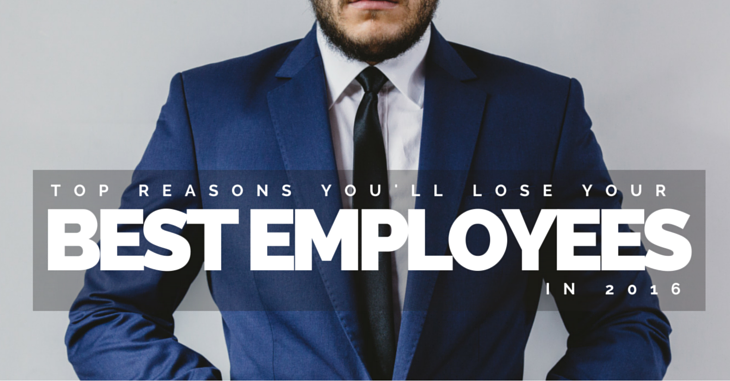 It’s every workplace’s nightmare situation: losing your top performers to some better external offer. Top performers are a lot more likely to be poached (or even just up and leave of their own volition!) if you aren’t correctly managing their expectations. A study by SAP and Oxford Economics reveals that one in five high performers are likely to leave their jobs in the next six months. You cannot always be aware of every employee’s state but a great approach is to reach out often to ensure those top performers have everything they need to perform at their best. Check out some of the top reasons that your staff is getting ready to fly the coop. You can safely assume that your best employees are also those that are emotionally invested in the success of the company. It doesn’t have to be as bad as a sinking ship to deter top performers. If they are finding that the business is failing to grow they are often extremely tempted to jump ship. It’s time to overhaul your business plans and have a hard look at why growth is stunted. Don’t just do with that what you will. Involve your employees, especially those top performers, and ask them for input. Every committed employee is eager to be involved in company decision- making. Employees expect that if they work hard for a company they will be rewarded accordingly – whether from bonuses, benefits or promotions. If a position comes up within the company that you cannot fill internally then consider a second look at the contenders. Promoting from within fosters confidence amongst all employees and builds a strong team environment. Just be sure to provide the newbie with a strong team and the training they need to perform. Even if external applicants have more experience, you might like to consider training an internal applicant instead. It is true that not all people within your organization need to know the minute details about the business. Yet, you need to make sure that top performers know enough to understand the bigger picture. Details in upper management shouldn’t always be kept shielded from your employees. This can ultimately lead to a feeling of distrust, or at the very least unease. An open door approach goes a long ways with team members. Most employees simply hate not knowing what is going on. Allow people to come and chat if they feel like they’re being left out of the loop, and don’t let office gossip take hold to undermine your decisions. Top performers will find out what’s happening either way, and it’s better to hear news straight from the horses’ mouth. Staff development should be high on your list of priorities to retain your best employees. Any job, that becomes stagnant will eventually become boring — especially so to those who are most engaged. Consider offering training, short courses and mentoring. Think about trials involving job swaps, or donating a few paid work hours per week to employees’ own (somewhat job-related) passion projects. Make sure that your employees are being stimulated – or they’re likely to find another work environment that offers it to them. We don’t just mean acknowledging people’s efforts verbally, be it in a one-on- one or group situation. And we don’t just mean salary or bonus top ups. Do you give employees small and frequent rewards for jobs well done? Low cost, but thoughtful Items are often the best incentives to keep spirits lifted. Items like movie tickets, restaurant vouchers, or even flowers can make your staff feel appreciated throughout the week. For good work on team projects a luncheon out of the office is a feel-good way to celebrate their efforts. Don’t fall into the trap of giving to keep up with the status quo. These gifts must be given with confidence and in an almost random fashion to retain the feeling of a reward. All horrible boss stories aside, if the folks in your management team weren’t born managers then they probably shouldn’t be there. Even if your managers get the job done, if they are abrasive with employees or micro-manage, employees will lose hope. You need managers who engage effectively with their teams and actively encourage creativity. You need them to be ready and willing to accept change in methodologies and ways of thinking. Despite challenging and rewarding work, if your work environment looks like a prison, the effects are going to rub off on top performers. Rooms with no natural light, too high heating or cooling, too high cubicles, uncomfortable chairs… think San Quentin. You want work to be somewhere where staff members feel comfortable, not somewhere that is slowly but surely sapping their will to live. Adding simple touches to ensure everyone is comfortable does not cost much and it can make employees feel considerably better. Get your business back on track by implementing these changes to ensure your best performers stay exactly where you need them most. Discover how GoCo can simplify your HR, benefits and payroll so you focus on keeping those top performers delighted and engaged.